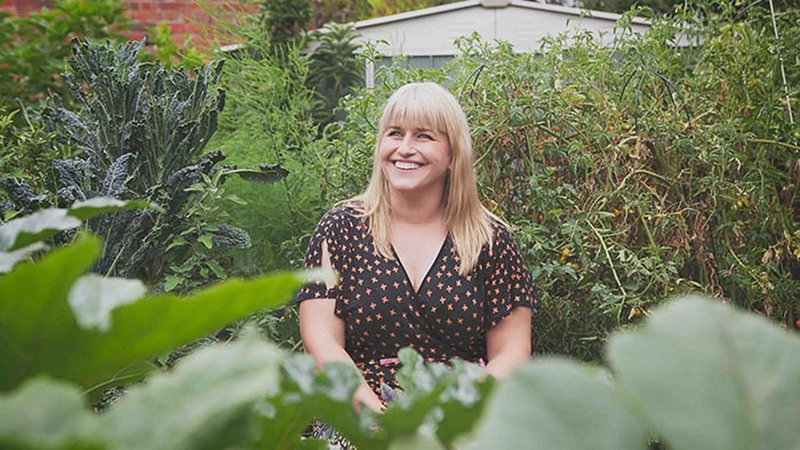 Masterchef winner Emma Dean shares her best advice for starting a thriving kitchen garden. I think the most important thing for growing your own food is having good preparation. If you have a good set up then often the maintenance is really easy. People often grow things in pots – but often the pots aren’t big enough, so the plants dry out and die. That’s what I see the most. The main thing is to have them so they can drink the water. Especially in Australia, you need mulch and you need to keep it moist. If you use a black pot it can often get too hot, so terracotta pots are great. For growing things in the ground, I’ve got raised garden beds that I made myself, which you can do quite cheaply. This winter I also want to install wicking beds, where there’s water underneath and the plants grow big long roots so you only have to water them once a week. You don’t have to plant much – I started out just growing tomatoes and basil and I thought, this is great! Then the next year I branched out to a lemongrass plant, and so on. I love growing herbs especially because they’re so fragile; they do go saggy in the fridge after a few days, so if you have a really good herb garden it makes things really easy in the kitchen. Flat leaf parsley is really good for beginners to grow, and thyme, rosemary and oregano – all the old essentials. Mint is great in summer for salads and drinks. It does need a lot of water, but it’s pretty tough. And I think there’s nothing better than tomatoes and basil grown together in summer – you can live off that! When we were little we used to pick field mushrooms, so I have great memories of that. Then I did a course on the Mornington Peninsula about mushroom foraging and I learned to identify Slippery Jacks and pine mushrooms, which are quite distinctive to look at. Then through friends and friends of friends I learned about all different bits and pieces. Fat hen. It grows all along the train lines, it just goes nuts. It’s very distinctive – kind of like an arrowhead shape. It goes crispy when you fry it so it’s great to sprinkle over meals, and it’s really high in vitamins A and C.
Chickweed. Chickweedis really nutritious and it grows all around in the backyard; people pull it up all the time. It tastes a bit like peas so it’s great to put in a salad. I’ve been lucky enough to have people who can teach me how to identify these things, but there are courses around and there are lots of good guide books as well. As long as you can identify them it’s quite fun and quite easy. Ask where things are from. Talk to the people who make it, ask those questions about where it comes from, and support your local producers. Go to farmers' markets. Farmers' markets are fabulous! It’s a really fun morning activity, and the fruit and veggies are really reasonably priced because you’re getting them straight from the farmer. And you can have a chat with them – I’ve learned heaps of great things that way. Support free range. Free range is definitely, without a doubt, the most important thing to support at the moment. It’s important for the animals but also for our health as well – if the animal has a more natural upbringing there are less hormones and chemicals in the meat.